These Scooter saddle bags provide a rear holdall and two side pannier bags. 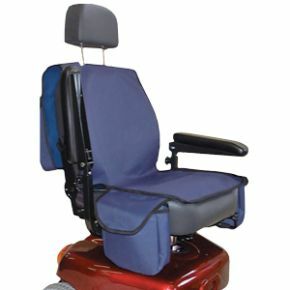 It also has slots to facilitate its use with captain seats and headrests. I'd been looking for something to replace the ubiquitous wire basket that one finds on almost all mobility scooters. I had in mind some sort of saddle bag layout as you find for horses. I e mailed Nigel to explain what I needed. He put the very product on the website. I placed my order and 24 hours later it was on my scooter!! You can't beat that for service. The "saddle bag" has 3 large pockets/pouches. The rear is a large pouch - very handy for my rain gear and tool kit. The side pockets are a good size and useful for drinks, mobile phone and the usual paraphanalia everyone takes with them even on short trips. The whole thing fitted easily onto my Breeze it took about 5 minutes as I had to adjust the straps otherwise it would have taken a matter of a minute or so. Its comfy to sit on and appears to be waterproof too although I haven't tested that aspect yet. At the price I think its excellent value for money (it get rids of the wire basket, so any price would have been reasonable - well almost!!) and there are a good choice of colours and sizes to suit everyone's scooter. Please feel free to use these comments if you require. I have received my order safely and would like to compliment on swift delivery,it is very good buy. Not quite the capacity I had expected, but adequate for most of my shopping trips and certainly good for personal items like mobile phone, spare specs, etc.. Delivered very promptly.